I ran my first half marathon yesterday. I'm a 48 y/o female and my time was 2:11 (gun time). 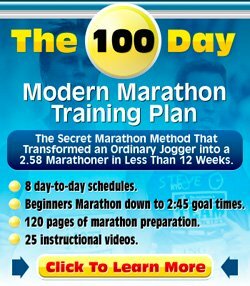 I trained with one long run a week and two short runs -combined with some strength training. If I increase training efforts would it be possible -in two months- to cut my time by eleven minutes? Thanks for your question about half marathon training. First of all, well done on finishing your first half marathon. It is impossible to predict whether you will be able to cut your time by eleven minutes. It's like asking how long a piece of string is. Eleven minutes is quite a bit and two months is pretty short. You'd have to run about 35 seconds per km faster (just below a minute a mile). That's pretty tough. However, that is not to say it cannot be done. I am assuming that you started from a zero base and have now built up to reasonable mileage with your two short runs and one long run a week. The benefit you now have is that you can build on your fitness and throw some speed work in the mix to get faster. Keep on doing the weekly long run - It is a critical part of your half marathon preparation. Not sure how long your longest long run has been but build it up slowly. Getting to 15 miles or so for your long run would be great, but it is not a hard-and-fast rule. Just build it up slowly from where you are now. Also see the increasing mileage safely page. Do a weekly goal pace run - Work on running at goal pace. You can start with a short run, or make it part of an easy run in which you run a few miles at goal pace. Again, build up from there. What is critical here is getting used to goal pace, as well as understanding how hard it is. Is it doable or not? Does it feel reasonably easy, something you could do for two hours in a row, or do you need to slow down? Half marathons are run at a pace somewhat below your lactic acid threshold pace. This is the pace at which lactic acid starts building up in the muscles at a rapid pace, leading to heavy legs. This will be a really good test to understand if your goal pace is over or below your lactic acid threshold. If it is a comfortable speed, then good, you have a chance. If it is not a comfortable speed, then you need to reconsider your goals. Going out at a pace that is too fast for you is not a good strategy for a fast half marathon! It will make for a fairly painful 2nd half and that is not an enjoyable experience. Trust me, been there, done that! Do a tempo run - Tempo runs are runs at whicj you train your body to improve the lactic acid threshold discussed before. They are a vital component of your plan. Start off with something like 4-6 x 1 mile with 2 min rest, then you can build up from there. Read more on the tempo running page. To these three "quality" runs I would add easy running, cross-training or resistance training as you see fit. Running a half marathon on three runs per week alone is a big ask, but if you add in some other cardio and/or some strenuous resistance training you can do it. For more guidance I'd like to refer you to the running training section on this website as well as my Best Running Coach coaching service, which provides fully tailored running programs.